You’ve converted your home to a greener one, and are cooking healthier foods. But is your cookware dangerous? It does little good to choose the freshest, organic food if the cookware you use to prepare it is toxic. 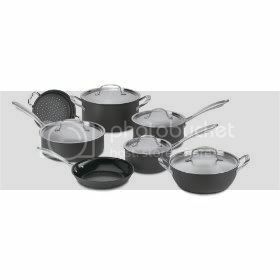 Description: A 12-piece set of Cuisinart Green Gourmet Hard Anodized Cookware. They are energy-efficient and eco-friendly with Cermica nonstick surfaces that reduces your carbon footprint and with the nonstick coating also allows for easy food release and the ability to use less fat and oils while cooking. As a family that buys a lot of organic and healthy foods for higher price tags than most I have always been really alarmed to know that conventional non-stick cookware can be dangerous and even toxic to use. The Teflon is the non-stick cookware off-gasses and can easily be scratched off and end up being eaten by your family. Eating Teflon and breathing in dangerous chemicals when cooking over high heat did not appeal to me in the least so I have avoided the convenience of non-stick cookware for years. Stainless steel is a healthier alternative but you don’t always know what you’re getting there either. Stainless is often mixed with nickel (highly allergenic to some) and other metals. Aluminum is not safe for cooking, and although glass is inert, it’s famous for burning your food. Cast iron has been a staple in many green homes, but it’s so heavy and some cooks just don’t master the art of seasoning it. Arthritics and older persons may not be able to use cast iron. It also reacts badly with acidic foods and coconut oil. Things have changed though with the release of some new greener and cleaner cookware lines including the Cuisinart Green Gourmet Cookware set. It is made with Cermica and this new technology creates a non-stick surface that works just as well as Teflon but without the safety issues. I am finally getting to use non-stick pots and pans again and it feels great. The food flakes right off after cooking with them, making clean up time a snap. You don’t need to use grease and oil on the pans to avoid the “stick” issues so food cooked on these is healthier too. After years of making eggs in bacon grease I am happy to say that all there is in our scrambled eggs now is eggs! The Green Gourmet line is also a very nice looking set of pots and pans. I am recommending them to all my friends.